Five students will receive financial support for the 2018-2019 school year from Lallemand Animal Nutrition as part of the 2018 Lallemand Forward scholarship program. 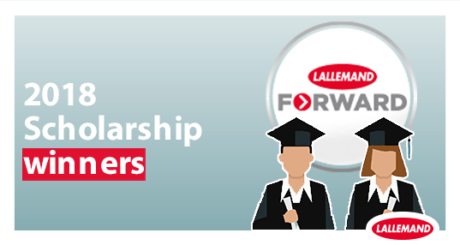 The Lallemand Forward Scholarships recognize North American students at the doctoral, master’s and undergraduate levels who are excelling in their agricultural programs. The program is part of Lallemand Forward, which are specifically chosen service solutions that enhance people, knowledge and production practices. Peterson will receive a $3,000 scholarship to support her doctoral work. She is originally from San Diego, Calif., County, where she was active in FFA. Peterson completed her bachelor’s degree in animal science at UC Davis then worked as a necropsy technician at the California Animal Health and Food Safety Diagnostic Laboratory and completed multiple internships at the UC Davis School of Veterinary Medicine. She earned her master’s degree in animal biology and worked in Dr. Frank Mitloehner’s laboratory where she focused on air quality and environmental management of beef and dairy cattle. In graduate school, she led two dairy cattle nutrition trials and been a supervisor on beef cattle feeding trials conducted in Dr. Mitloehner’s laboratory. Grant will receive a $3,000 scholarship to help complete her master’s degree at Purdue. During her undergraduate studies, Grant developed a passion for teaching and global learning. She volunteered in Australia and South Africa and fulfilled part of her degree at the University College of Dublin in Ireland. After Grant earned a bachelor’s degree from Purdue, she worked as a production supervisor in the food industry. Grant’s graduate research focus is in intercultural education. She has led undergraduates on food production study-abroad programs to Vietnam and Italy. Upon completing her master’s program, Grant plans to return to industry in the role of a change communication manager. Heberling will receive a $2,500 scholarship to help support her undergraduate work at Michigan State. She was raised on a 100-cow dairy farm in Michigan and served as a Michigan State FFA Officer. Heberling works for the Michigan FFA Association as the editor of their quarterly magazine and as director of audio and video for the state FFA convention. She completed a marketing internship at the Michigan Milk Producers Association and plans to pursue a career in agricultural marketing. Rojas will receive a $2,500 scholarship as he pursues his animal science degree at Kansas State University. Originally from the Chicago area, he is the first person in his immediate family to attend college and hopes to become an animal nutritionist. Rojas developed an interest in animal nutrition after learning about the subject at school. He plans to pursue a master’s degree in animal nutrition after completing his undergraduate degree. Sweitzer will receive a $2,500 scholarship as she pursues a bachelor’s degree in animal science and minors in both agribusiness management and poultry and avian science at Penn State. She is serving as president of the Penn State Block and Bridle Club and is a member of the Poultry Science Club. Her passion for agriculture stems from years spent working on the family farm in in Wellsville, Penn. Sweitzer plans to pursue a career that helps feeds a growing global population.